Just choose the contract you would like to use, print, and fill it out. Make sure that the proper individuals review and sign the contract, as well as, provide all parties with their own copy. If there is a section that does not apply to you, just write in N/A for not applicable. Having a contract will help all parties to fully understand what is required of them. Getting the contract notarized will add an extra layer of security in the event the contract would ever need to be used to settle a legal dispute or to justify a termination of employment. 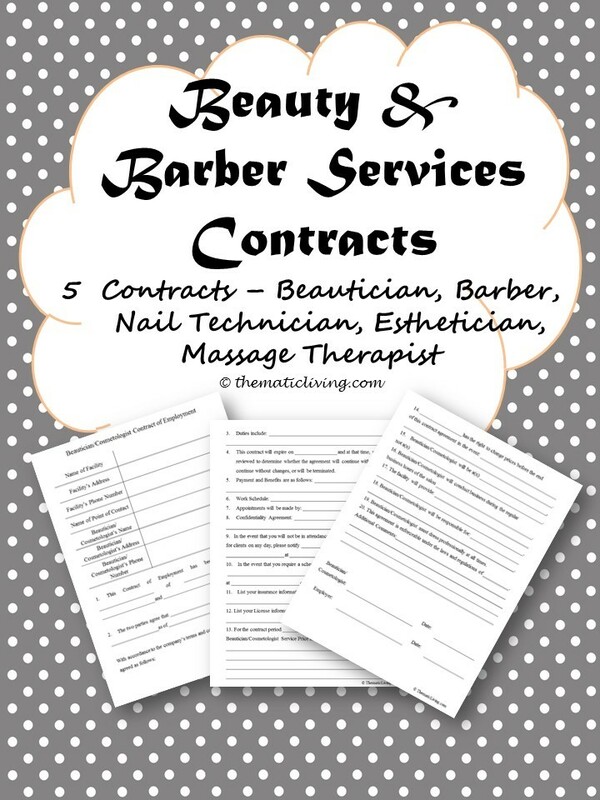 Before searching for a professional to fill a beauty/barber service, print and fill the form out so that you know what you are looking for when hiring/being hired. If you have a request for a different contract that would make your life easier – contact us. This resource can only be used by one person and should not be shared or sold to a third party.